Mercedes driver Nico Rosberg pipped teammate Hamilton for pole near the very end of Q3, when Hamilton erred at Turn 1 on his last possible attempt. That was a surprise but well earned pole for the German, because Hamilton had owned every free practice session all weekend. They lined up next to one another on the grid, with both on the medium tire and both pointed at the center of the track, aiming to chop the other off. When the lights went out it looked like both got perfect starts, but Hamilton’s was a touch more perfect, pulling alongside and then past Rosberg as he got up into the gears. Come Turn 1 he had his nose in front and got the inside line, Rosberg still shadowing him on the outside. Through the next complex of corners, though, Hamilton made better way and finally got his rear diffuser placed firmly in front of his teammate by the time they got out of Turn 4. Rosberg never let him get away and always looked to make a move down the main straight as the two fought for the first few laps. When Rosberg’s race engineer radioed to tell him to care for his tires and think about a possible alternate strategy, Rosberg lay off a little but stayed in Hamilton’s mirrors until the first round of pitstops, when the German attacked again. He ducked inside of Hamilton and passed at the end of the front straight, but Hamilton took the inside line on the exit and pushed Rosberg well onto the kerbing, the two going at it again for a few corners until Hamilton, again, got himself solidly in front of Rosberg and was then able to pit first, being the first Mercedes on track. Hamilton took on a set of soft tires, good for about half a second per lap over the medium tires, when Rosberg pitted a lap later he took on a set of mediums. During the second stint Hamilton built up a lead of about ten seconds on Rosberg, which he’d have to defend in the third stint when the tire strategies were reversed. 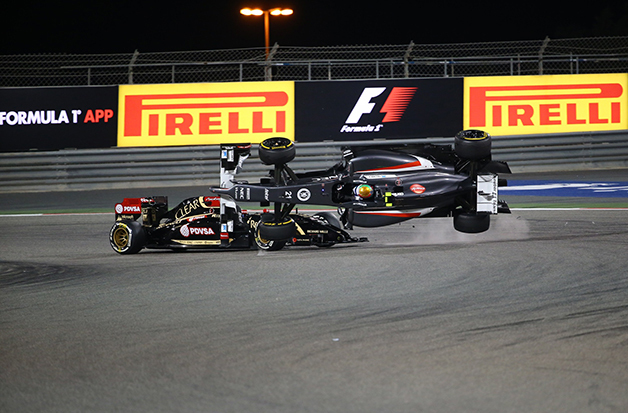 Enter Pastor Maldonado. As Sauber driver Esteban Gutiérrez rocketed toward Turn 1 around Lap 40, Maldonado exited the pits. For some reason, the Lotus driver shot out of the pit lane and straight for the apex at Turn 1, where Gutiérrez was turning in on the racing line, and Maldonado’s Lotus speared into the rear right corner of the Sauber, the tire-on-tire contact flipping Gutiérrez’ car across the track and into the tarmac runoff area. The Lotus was, incredibly, unhurt and continued. 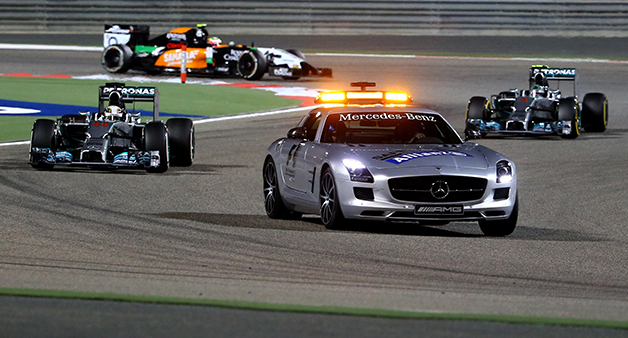 The Safety Car emerged while the Sauber was removed, erasing Hamilton’s advantage over Rosberg. Just as the Safety Car was about to return to the pits on Lap 47 with ten laps remaining, Mercedes AMG Petronas technical director Paddy Lowe came on the radio to urge both boys to “Bring the cars home.” Probably everyone watching (including us) wondered if those were veiled team orders, but it didn’t take one corner to find out they weren’t: Mercedes said it would let its drivers race, Rosberg immediately jumped all over the back of Hamilton and for the next ten laps they stayed within a second of one another. Neither one of them made a mistake or put a wheel wrong, but as has been said many a time, it’s one thing to catch, it’s another thing to pass; even with the faster tire, Rosberg couldn’t past Hamilton and his perfect driving and defending. The Brit crossed the finished line first, his teammate a second behind. 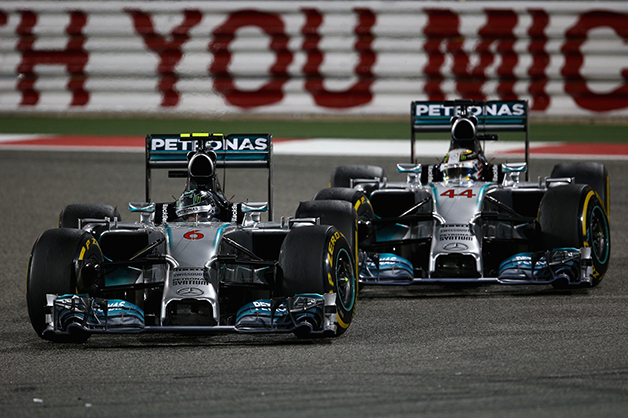 Hamilton later said it was the hardest race he’s ever won, Rosberg said it was the best battle of his career. For us, it was outstanding watching. We also learned just how good Mercedes is; finally forced to race with everything they had, The Silver Arrows showed themselves to be two seconds per lap ahead of the field. An elated and relieved Sergio Perez grabbed third place by the neck, after dicing with his teammate Nico Hülkenberg in the first stint and pulling off a pass that had Hulkenberg complaining to his engineer. During the last ten-lap sprint, Daniel Ricciardo in the Infiniti Red Bull Racing in fourth closed in on Perez at half a second a lap from about six seconds back, Perez’s race engineer telling him “He won’t catch us at this pace.” If the race had gone one more corner, that would have been a lie – the Red Bull was sniffing all over the back of Perez come the last few corners, and it was only the checkered flag that saved Perez from having to settle for fourth. 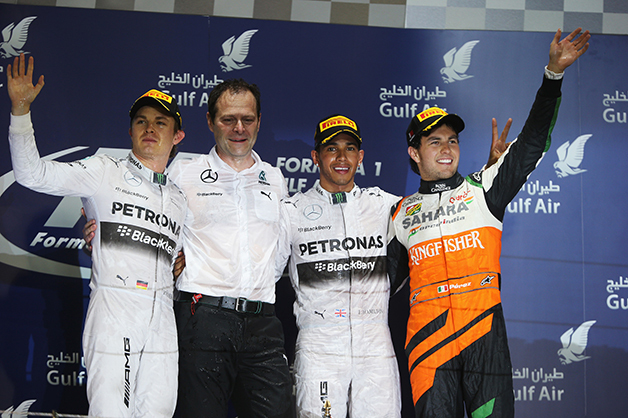 In just his third race with the team and after having been soundly beat by his teammate in the first two races, and after the last miserable year with McLaren, Perez was thrilled to get on the podium. 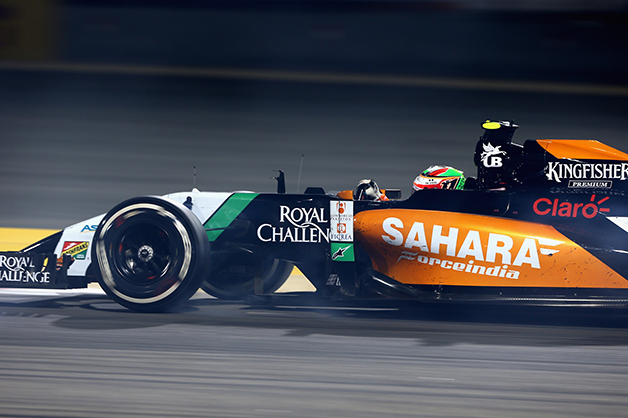 It’s Force India’s first visit to the rostrum since Giancarlo Fisichella did it at the Italian Grand Prix in 2009. Hülkenberg came in fifth, proving that Force India has built a strong car around that really strong Mercedes power unit. 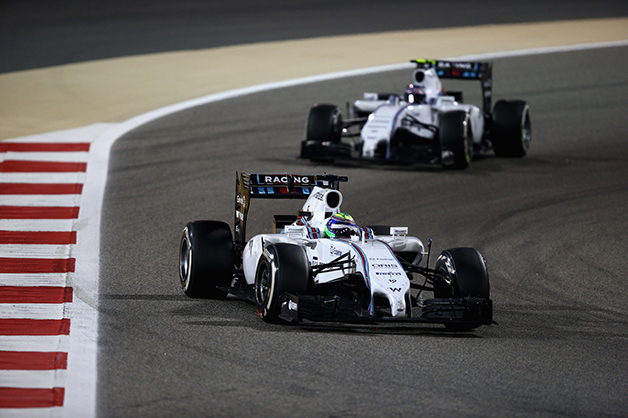 The Williams duo of Felipe Massa and Valtteri Bottas took seventh and eighth, punished for doing three-stop races instead of two. The Williams’ showed plenty of speed in the opening stint, doing healthy battle with the Force Indias early in the race; if not for that extra stop there’s no reason to believe they wouldn’t have owned third and fourth position. 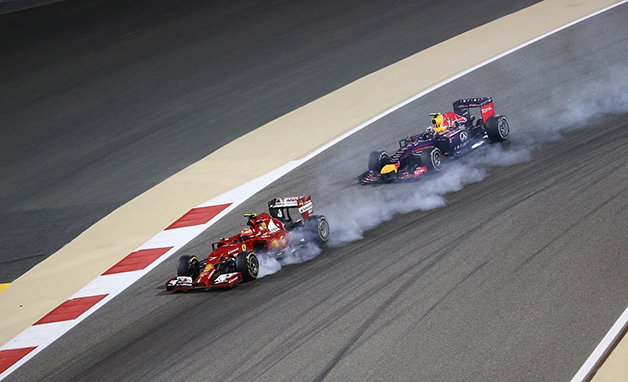 In ninth and tenth came Ferrari drivers Fernando Alonso and Kimi Räikkönen. Alonso made no excuses for the finishing positions, saying “we were just ninth and tenth and that was what we could do today.” Räikkönen said the car is lacking just about everywhere, but not so much to explain why he felt like he was racing in a different class to the Mercedes-powered cars. Both drivers said the Ferrari T14 is improved over the first races and they expect things to get better, especially when the European rounds begin. It is, for us, a head-shaker to see Ferrari seemingly in the same position this year as the last five years, putting in a good pre-season and then fighting for mid-top-ten finishes for the first half of the season. As for that Maldonado incident, he got a ten-second stop-go penalty, a five-place grid penalty for the Chinese Grand Prix and three points added to his license. It’s a little surprising that Ricciardo got a ten-place penalty for unsafe release when his team recognized the error while still in the pits, but Maldonado gets five places for sending another car somersaulting across a hot track because of an incomprehensible move. But ah well – better news for Lotus is that it got both cars to the finish for the first time, in Romain Grosjean in 12th, Maldonado in 14th. That’s the opposite fate of McLaren, which retired both its cars late in the race with what looked like engine trouble. Hamilton’s victory still leaves him second in the Driver’s Championship with 50 points behind his teammate who has 61, and Hülkenberg’s 28 points leapfrogs him over Alonso with 26. Mercedes AMG Petronas is already in the triple digits in the Constructor’s Championship, their 111 towering over Force India in second (!) at 44 and McLaren in third with 43. 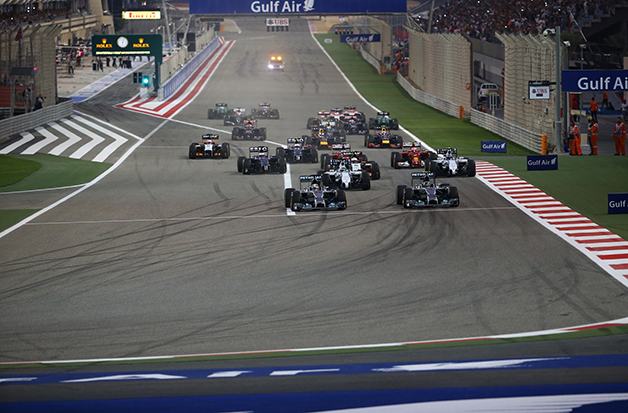 The Chinese Grand Prix comes in just two weeks, but we’re certain that we’ll still be thinking about this one. See you then.